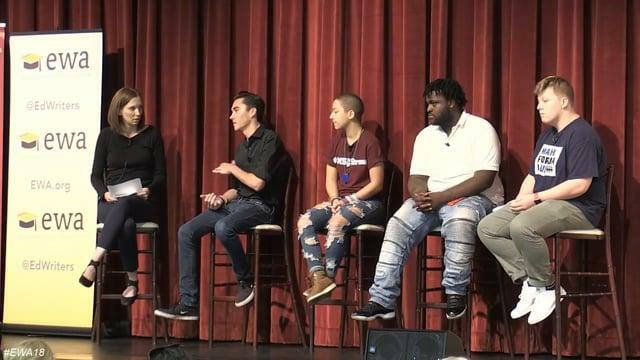 The high school students—Emma González and David Hogg of Parkland, Fla., Alex King of Chicago, and Jackson Mittleman of Newtown, Conn.—rattled off statistics to make the case for gun control, and shared how they turned personal experiences of violence into a commitment to push for change. They spoke during a panel discussion moderated by Education Week staff writer Evie Blad at the University of Southern California here on Wednesday. “This isn’t just an issue that we care a lot about; this is a part of us now,” said Mittleman, a Newtown High School junior and the co-chairman of the Jr. Newtown Action Alliance. He was 11 years old during the 2012 shooting at Sandy Hook Elementary that killed 20 children and six educators. In fact, several young activists will spend the summer “bouncing around from community to community” to have conversations about how to prevent gun violence, said González, a senior at Marjory Stoneman Douglas High School, where a gunman killed 17 people on February 14. The conversations will be with “young people who need to have their voices empowered because for so long, they’ve been squished down,” said Gonzáles. The first stop on the tour will be Chicago on June 15, said King, a senior at North Lawndale College Prep High School there. King is a member of the Peace Warriors, a group that offers support to students who have lost a loved one to gun violence. King, whose 16-year-old nephew was shot and killed a year ago, said the Peace Warriors have met with 160 students at North Lawndale this school year. This type of advocacy is critical to holding politicians accountable, because it makes sure they don’t forget victims’ stories, said Hogg, a senior at Stoneman Douglas High School who along with González is one of the most publicly visible activists from the Parkland school. While the shooting was taking place at his school, Hogg said he recorded some of his classmates on video talking about how they were feeling during the lockdown. “If we did die in that classroom, I was hoping that our voices would carry on even if our souls wouldn’t,” he told the audience. For too long, the student activists said, efforts to prevent gun violence have failed to lead to significant changes, such as tighter gun controls. But young people refuse to “bite [their] tongues,” King said. Teenagers, he argued, are committed to making change. When asked by an audience member how they had become so confident and articulate on these issues, González was quick to answer: “What I love is that people sent us to high school so we could learn stuff and then are amazed that we paid attention,” she said. The day of the shooting, González said she had been learning about special interest groups and the National Rifle Association in class. During an emotional speech at a gun control rally in Florida that went viral in the days after the shooting, she held up her Advanced Placement Government notes. She had planned to reference the Supreme Court case Tinker v. Des Moines, which affirmed students’ constitutional rights to free speech, but she couldn’t read her notes through her tears, González said. Hogg said he had done extensive research on gun violence before the shooting happened, as part of a speech and debate class Stoneman Douglas High School. In the days after the shooting in Parkland, King and some of his fellow activists from Chicago flew down to Florida to meet with the teen survivors. The students have since been trying to expand the conversation past school shootings to encompass gun violence of all kinds. The students are pushing for measures like universal background checks, prohibiting the purchase semi-automatic weapons, and imposing stricter federal laws against weapons. They also want more mental health and trauma counselors in schools. Hogg said that too often, the public’s attitude toward the gun violence occurring in major cities like Chicago is, “that happens there, we can’t do anything about it.” He was disturbed that only when a shooting happened in a suburb—Parkland is a mostly white, affluent community—did people start paying more attention. For the students, “it was common sense” that they include activists from Chicago and other cities where gun violence is so commonplace, González said. Beyond the summer conversations tour, the activists are figuring out their next steps, especially as many of them will graduate from high school this spring. They all said they feel a sense of responsibility to continue this work. Hogg, for instance, said he is taking a gap year before college to continue his advocacy. He said he’s currently working to persuade the U.S. Congress to enact legislation that would address some of the issues. If it doesn’t pass, Hogg said, he will campaign to persuade the public to vote those legislators out of office. Part of that will be carried out by harnessing student activism. On May 29, high schools across the country will register students to vote through HeadCount, a nonpartisan voting organization, Hogg said. Meanwhile, Mittleman said he wants to continue the conversations about what happened at Sandy Hook Elementary and other places. For a while, people in Newtown found the shooting too painful to discuss. Now, he said, they’re starting to talk about it again. It’s important to not normalize gun violence, King said. Too often in Chicago, he said, people don’t talk about those who were killed by guns. “I’m here to bring those names out of the shadows,” he said. The activists all said they feel a sense of responsibility to their friends, relatives, and peers who died to keep telling their stories.